Greg Rossell, left, Kathy Barrett and Jennifer Piper protest in front of Sen. Cory Gardner’s office Monday in Bodo Industrial Park. Araceli Velasquez is one of four women living in sanctuary in Colorado to avoid deportation. She fled from El Salvador and is living at the Park Hill United Methodist Church and Temple Micah. 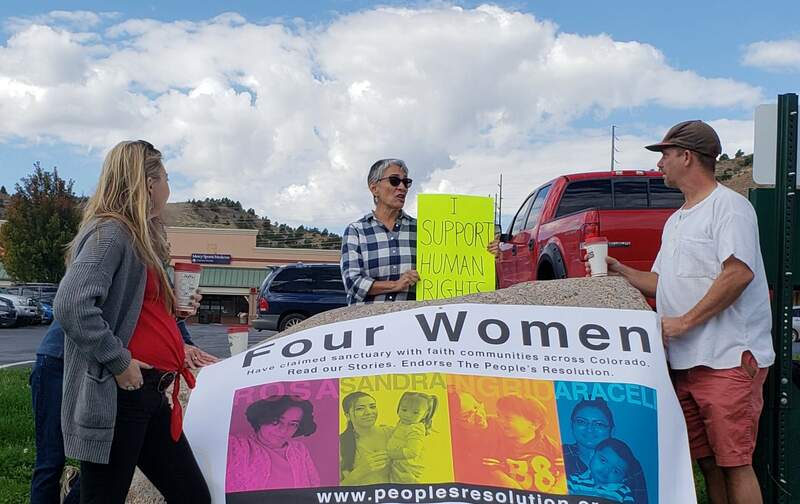 The experiences of four women living in sanctuary across Colorado, including one in Mancos, have helped lay the foundation for proposed immigration reforms. 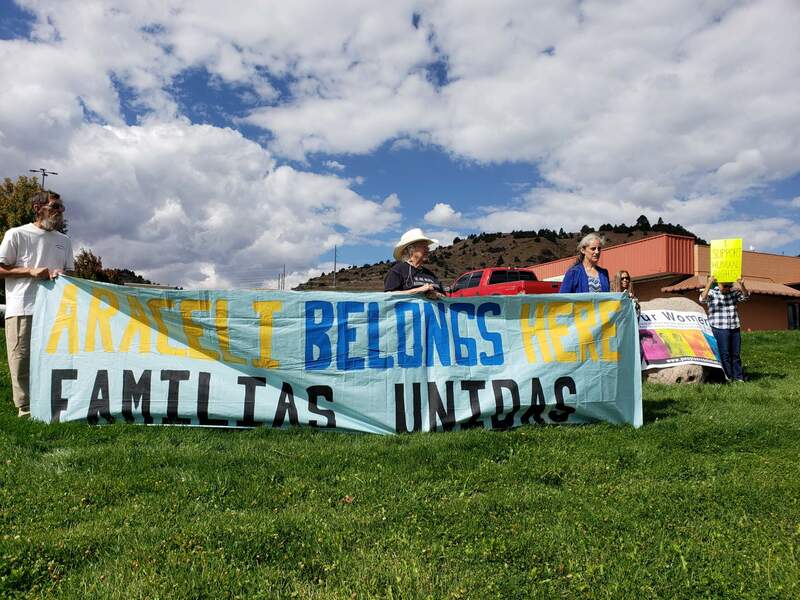 A small group of advocates protested Monday in Durango as part of a four-day caravan across Colorado to raise support for a specific set of reforms. “I believe in the right of people to be where they are and be safe and be treated as human beings,” said Kathy Barrett, a Durango resident. She was among a small group gathered in front of the Centennial Center in Bodo Industrial Park where Sen. Cory Gardner, R- Colo., has an office. The advocates are promoting the “People’s Resolution,” a set of changes in immigration law based on the experiences of the women living in sanctuary, including Rosa Sabido, who lives in the Mancos United Methodist Church, said Jennifer Piper, an interfaith organizer with the American Friends Service Committee, a national Quaker Organization. The caravan is also supported by Colorado Immigrant Rights Coalition, the Colorado People’s Alliance and local sanctuary coalitions supporting the four women. Mary Cosgrave, Gloria Leyba and Jason Hotchkiss participate in a small protest Monday outside of Sen. Cory Gardner’s office in Bodo Industrial Park. The sign they are holding depicts the four women living in sanctuary across Colorado to avoid deportation. The women in sanctuary are not trying to run or to hide from the fact that they fell out of legal immigration status, Piper said. “What they are saying is there are other solutions to make that right, that would make more sense than deportation, which is such a cruel and extreme punishment,” she said. Sabido has applied for residency multiple times during the more than 30 years she has lived and worked in Montezuma County. Most recently, she applied for residency in 2001. But federal immigration is so backed up that her petition is pending, Piper said. To work toward change, each of the four women examined her immigration case and asked what law kept her from applying for legal immigration status. The changes would allow the four women to have a path to legal immigration status, along with thousands of others, Piper said. The People’s Resolution calls on Colorado’s senators and representatives to create a path to legal permanent residency for those who have temporary protected status because they came from dangerous countries, such as El Salvador, Yemen and Syria. It also requests a path to legal permanent residency for beneficiaries of the Deferred Action for Childhood Arrivals program and the parents of U.S. citizens. Protection for asylum seekers and an elimination of immigration quotas are also called for in the documents. Amada Hotchkiss, 17, of Durango was among those protesting near Gardner’s office with her father. She would like to see far more people involved in the effort to encourage change, she said. “I feel like everybody should have equal rights,” she said. The caravan planned to stop in Mancos, Grand Junction, Carbondale and along the Front Range. Advocates expect to meet with the staff members of almost all of Colorado’s U.S. senators and representatives.